The 1977 serial The Sun Makers was one of the last Tom Baker stories to be novelised. 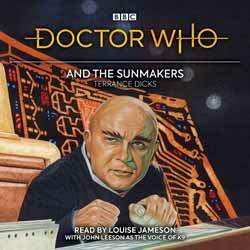 In fact, by the time Terrance Dicks’s Doctor Who and the Sunmakers hit the shelves in 1982, there was only Meglos left to go, apart from an adaptation of an LP record (which followed in 1991), three troublesome Douglas Adams serials and a couple of unmade movie scripts (which eventually saw print during the last few years). It was also the final entry in the Target Books range to include the words “and the” in the title wording. The five-year gap between transmission and novelisation resulted from concerns on the part of the publishers that the subject matter and lack of monsters would limit the story’s appeal to Target’s (ahem) target audience of young readers. The original serial, written by Robert Holmes, is a satire of the British tax system, with the unfortunate populace of Pluto (which at the time of writing was still considered a planet) being literally worked to death in order to make ends meet. With sardonic points of reference including the Collector’s pinstripe suit, a corridor designated P45, a tranquillising gas known as PCM (which in real life stands for Per Calendar Month) and a misquote from The Communist Manifesto, we have something akin to the undergraduate humour that would soon be associated with Douglas Adams’s time on the show. The novelist doesn’t make many changes to the original scripts, though his description of the fearsome rebel leader Mandrel (all brawn and scar tissue) is worthy of note. Dicks occasionally adds a moral commentary to the brutal situations depicted in the story, such as when Leela (in a scene that was omitted from the television version) sees a group of work units lined up obediently to have their employment and their lives terminated. Later, when the revolutionaries throw one of their former oppressors from the top of a tall building, they pause to consider that their actions may have gone “a bit too far”. Reader Louise Jameson (who played Leela) picks up on these moments of ethical reflection and delivers them with feeling. Jameson doesn’t really have the voice to do a full-on Tom Baker impersonation, but as usual gives us a reasonable impression of his style of delivery. She also distinguishes the supporting characters, including the downtrodden Cordo, the pompous Gatherer Hade, the gruff Mandrel and the nasal Collector. She doesn’t need to imitate K9, though, because John Leeson reprises his role as the robot dog, which livens up the narrative considerably. Doctor Who and the Sunmakers is not too taxing. You’ll easily be able to listen to this while carrying out E-grade chores such as ironing, or while driving to work to earn your talmars. Is it worth collecting? You have nothing to lose but a few quid.